fig. 1 - the balance nerve, and the hearing nerve combine to form the vestibulocochlear nerve or eighth cranial nerve of the brain stem. This nerve connects the ear to the brain through the brainstem so that you can hear, and stay balanced in gravity. 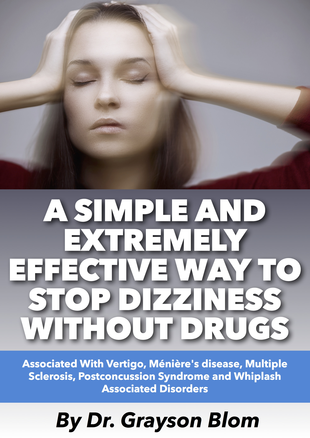 Vertigo is a condition of dizziness and loss of balance, you may even feel like the room is spinning up to and including nausea and vomiting. Hearing Loss can occur for many reasons and is commonly associated with vertigo. Tinnitus is described best as ringing in the ears that can present as a roaring, clicking, hissing, or buzzing type sensation and the intensity can vary. The common denominator is the eighth cranial nerve also known as the vestibulocochlear nerve and its relationship to the brainstem and upper cervical spinal column. The eight cranial nerve is very special as it is the all in one nerve that controls your sense of balance (vestibulo = balance), and it allows you to hear (cochlear = hearing). (see figure 1 above) When damaged or interfered with in any way it can cause any combination of vertigo, hearing loss, or tinnitus symptoms. In many cases an injury to the upper cervical spinal column is the the root cause. The eighth cranial nerve comes directly from the brain stem and CONNECTS the ear to the brain for your sense of balance, and hearing. What if you suffered an injury to your head or neck that interfered with the CONNECTION of the eighth cranial nerve, reducing its ability to communicate back and forth with the brain? Could this cause vertigo symptoms? What about hearing loss or tinnitus? What if this injury to the upper neck were to disrupt the normal blood flow to the area of the brainstem that controls the eighth cranial nerve? Is it possible that this could cause the nerve to malfunction producing symptoms? The most common CAUSE of Subluxation is a previous injury to the head or neck such as: a hard slip or a fall, a motor vehicle accident, a sport injury etc. A Subluxation occurs when the connective tissues that hold the upper cervical spine together are torn loose allowing one of the upper two neck bones to misalign and lock out into a stressed position. The brain stem exits the floor of the skull in this area and ends near the top two neck bones. Could a Subluxation interfere with blood flow in and out of the head?(ref. 1, 2, 3 et.al.) According to research it can in fact do so! Could a Subluxation interfere with how the brain talks back and forth with the body?(ref. 4,5 et.al.) According to research it can in fact do so! In virtually all cases the average time it takes for symptoms of a Subluxation to start showing up is 10-15 years and in many cases even longer than that. In many cases damage to the spine can be dated to give us an approximation of when the Subluxation began. It is eerie how often this matches up with a previous injury the patient sustained in the years prior, which is just now producing symptoms. It is important to also note that not all vertigo, hearing loss, and tinnitus are due to Subluxation. With that said the most commonly overlooked source of these problems is in fact due to a Subluxation. The bottom line is that a Subluxation is a neuro-vascular disorder that interferes with the nervous systems ability to communicate back and forth with the body and therefore produces some sort of dysfunction. What type of problem develops from a Subluxation depends on a several different factors such as: 1. the nature and extent of the spinal injury, 2. how long has the injury been present?, 3. most importantly the patients unique anatomy in the upper cervical spinal area. As an example it is known that there are over 83 different variations of how the blood flows in and out of the head. It is common knowledge that whatever structures in the body don't get enough blood, will not function properly. It is also common knowledge that a small amount of pressure or irritation to the brain stem or spinal cord can cause neurological dysfunction. Have you ever heard of DYSAUTONOMIA? Dr. Grayson Blom works with a nationwide group of Doctors expertly trained and specializing in the Upper Cervical Procedure. Dr. Blom is also one of the few Doctors in the state of Idaho trained and certified in the Upper Cervical Procedure. We are dedicated to helping patients just like you, who suffer from vertigo, hearing loss, tinnitus and other spinal-related disorders. Our office is offering a COMPLIMENTARY CONSULTATION to determine if you are a candidate for Upper Cervical care. You can give us a call at (208) 559-0541 or just click the button below. 2. Nan Z, Xiao-Ying Y, et al. Definition of the To Be Named Ligament and Vertebrodural Ligament and Their Effects on the Circulation of CSF. PLoS ONE 9(8): e103451. doi:10.1371/journal.pone.0103451. 3. Radak Djordje, et al. Incidence and distribution of extravascular compression of extracranial venous pathway in patients with chronic cerebrospinal venous insufficiency and multiple sclerosis. doi: 10.1177/0268355513486638. Phlebology May 9, 2013 0268355513486638. 4. Bakris GL, Dickholtz M, et.al. Atlas Vertebra Realignment and Achievement of Arterial Pressure Goal in Hypertensive Patients. Journal of Human Hypertension (2007) 21, 347-352. 5. Kessinger R, Anderson M, Adlington JW. Improvements in Pattern Analysis, Heart Rate Variability & Symptoms Following Upper Cervical Chiropractic Care. Journal of Upper Cervical Chiropractic Research May 9, 2013.